However, it is often very cumbersome to find out how the asynchronous requests work on a specific website, e.g. which URLs or which HTTP methods to use and how to structure the request. An alternative solution is to automate a whole browser so that each interaction with a website is scripted. The most popular software package for browser automation is Selenium, which provides a scripting interface for many browsers in many programming languages. We will stick to the Python API for Selenium and use the ChromeDriver to automate a Chrome or Chromium browser. A classic example of asynchronous server communication are the search suggestions that you get while entering a search query into Google search. Our goal is to automatically extract these suggestions by using an automated Chrome browser. I recommend to use an interactive Python shell such as IPython and run the code snippets step by step in order to see how the Python commands interact with the browser. 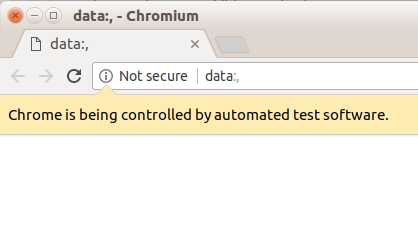 It says “automated test software” because Selenium is usually used to automate testing of websites. A ghostwriting browser! The first line is to select the search input element of the website using a CSS selector. For a given website, you will need to find a way to specify the element that you want to interact with. One way is to right click on an element in your browser and select “Inspect”, which will open the developer tools of your browser and show the nested structure of the HTML website, highlighting the current element and the “path” through this HTML structure. This can give a hint for the right CSS selector. With the search input it is quite easy, because it contains a unique element ID “lst-ib”. However, you should note that whenever the HTML code of the website changes, your CSS selector might not work anymore. The latter happens because the search query is evaluated as the automated browser “types”. 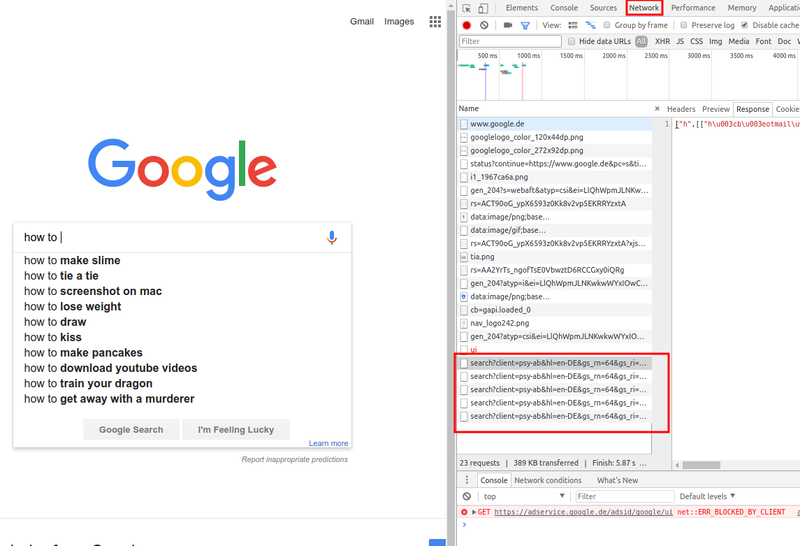 So it could be that we get search suggestions for the partial query “how to” because the suggestions for the full phrase “how to start” did not yet arrive! break   # break out of the while loop, because we got our results! We can see that the search results from Google are at least localized if not personalized, since the third result “how to startup beuth” refers to a Univ. of Applied Sciences in Berlin. That’s not a surprise — Google has a patent on that and concerns about personalized search results have been in the press long ago. First of all, web scraping can raise legal issues, from copyright issues to computer fraud and abuse. I recommend reading this article or the legal issues section of the Wikipedia article. You should always check the Terms of Service page of a website and respect the robots.txt when you think about scraping a website. You should also avoid flooding the website’s server with requests, i.e. limiting the number of requests you send within a certain time frame. From a technical point of view, implementing an automated browser should be your last retreat in case every other options for getting the data that you want, fail. This is because it can be quite cumbersome to work around all the problems that come up with asynchronous data retrieval. It can be very time consuming to build a “fail-safe” scraper with this method because so many things can go wrong on a website. And then again, all the work could be for nothing from one day to the other, if suddenly your target website gets a big facelift and its whole HTML code and user interaction have changed.